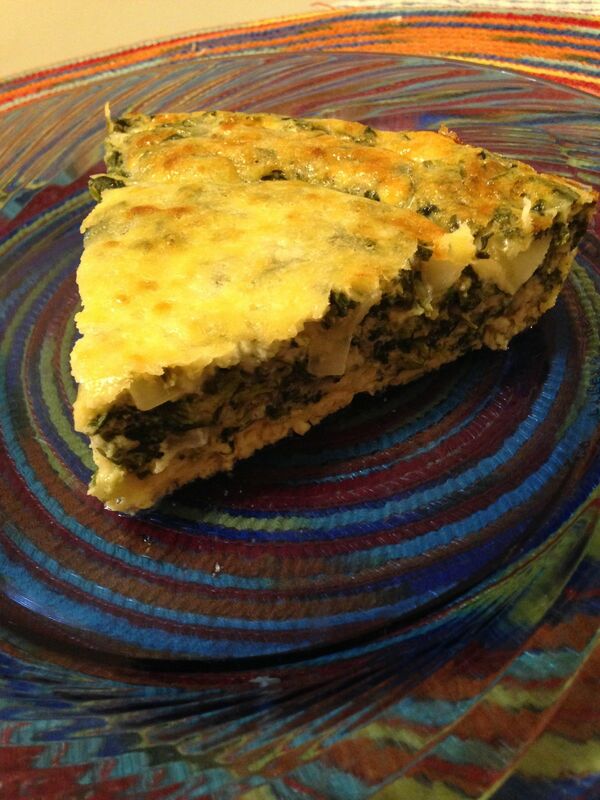 This recipe started out as a crustless quiche from The Frugal Gourmet, by Jeff Smith. (He used to have a cooking show on PBS, his cookbooks are great basic texts that cover many different cuisines and food traditions). Over the years I have lightened up this recipe so much that it seems misleading to call it a quiche. I ditched the stick of melted butter in favor of a little olive oil, replaced all the cheese with reduced versions, and bumped up the veggie content. Combine the onion and olive oil in a microwave safe bowl and microwave for 2 min. The onion should be soft. If not, cook for one additional minute at a time. Beat the eggs and egg whites, then add the cottage and mozzarella cheeses. Stir in the spinach and onions and season with pepper and dill, if desired. Butter the bottom and sides of a 9 inch glass baking dish or pie plate. Pour it all in and sprinkle the feta over the top. Bake at 400 for 15 minutes, then reduce the heat to 350 and continue baking until the eggs are set and the feta is a little bit brown (usually 15-20 minutes). Let cool for 10 minutes and serve with crusty whole grain bread and fruit salad for a healthy and hearty meal at any time of day! I’ve made this recipe with many different veggie combinations. You can swap out the spinach, dill, and feta for anything that sounds tasty to you! (just make sure the veggies are precooked) My mom frequently dices up any leftover veggies and uses up bits of pieces of different cheeses to make this. She has come up with some surprisingly delicious combos, but readily admits that some have been a bit weird ;). You can add ham or precooked bacon or sausage to satisfy the carnivores in your life, although this will affect the nutritional content. Make sure you butter the baking dish! This recipe sticks like crazy and oil or cooking spray just won’t work. The butter stays in a solid layer long enough to keep the eggs from gluing themselves to the dish and keep you from cursing while you scrub. A glass dish works best because it bakes more evenly and lets you see the bottom of the bake. This makes a great breakfast sandwich on the go, just heat it a little and put it on a whole wheat English muffin. You can double this recipe and bake in an 11x14 pan. There’s a little variation between the different versions. Here is the info for the spinach and feta version. This recipe is a little high in sodium due to all the cheeses, that’s why we didn’t season with any additional salt. When you change up the recipe, try to keep the feta cheese alternative to about 200 calories overall. For example, 200 calories of romano cheese is only about ½ a cup, but it packs a huge flavor punch.